We recently took a long trip in our camper van to the Yukon with lots of gravel road time. Given the length of the trip and the gravel roads, I decided to beef up the equipment we carry for emergencies and repairs. This page is a list of what we take. It may be helpful in formulating your own list. Other suggestions for what to carry? Please add a comment. I’d not be without a full size spare. On our ProMaster van the spare lives under the floor. It is cranked up and down by a little winch. This is a pretty common setup and the winches are not that reliable, so make sure that your winch works. I found that on ours some dry silicone lubricant makes it work better. 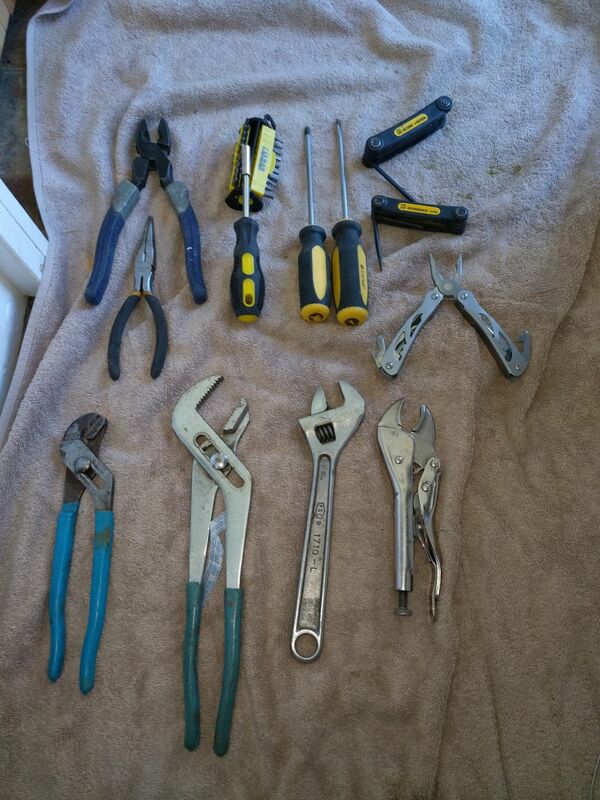 These are the tire changing tools we carry. 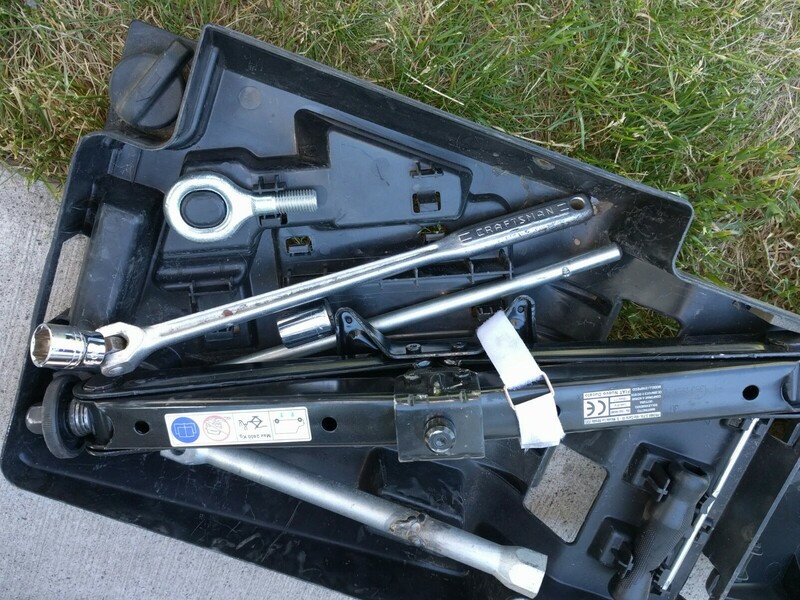 Most of them are just the kit provided by RAM, but the lug wrench that came with it is not strong enough, so I carry the 18 inch breaker bar with a six point socket that fits the wheel lugs. The eye bolt screws into a hole in the front bumper and is for attaching a tow strap. So, there is the jack, the tools to lower the spare tire using the winch, and the lug wrench. 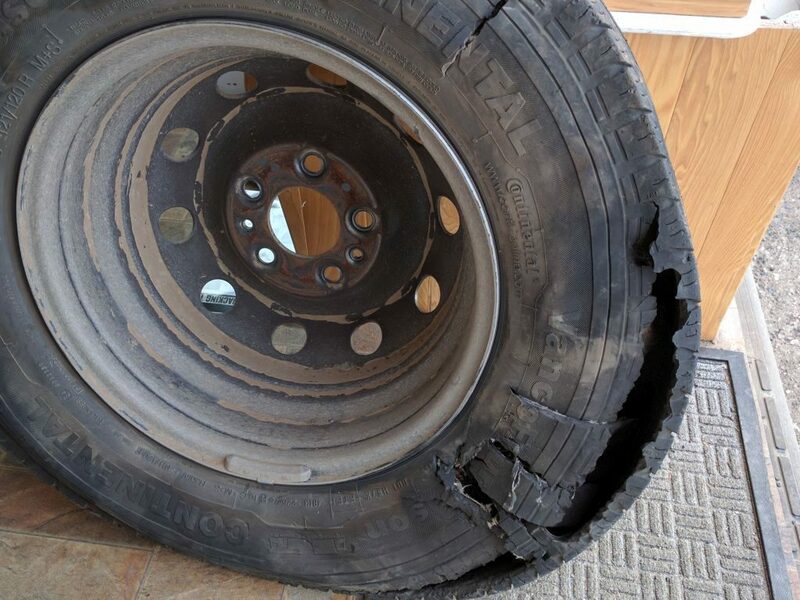 I think its really important to go through the whole process of replacing one of the tires with the spare before you go on the first trip — there are so many things that can go wrong, and you don’t want to find this out on a rainy night a hundred miles from nowhere. The upper right is a kit to fix a puncture with a rubber plug. Does not always work, but easy to take along as a backup. 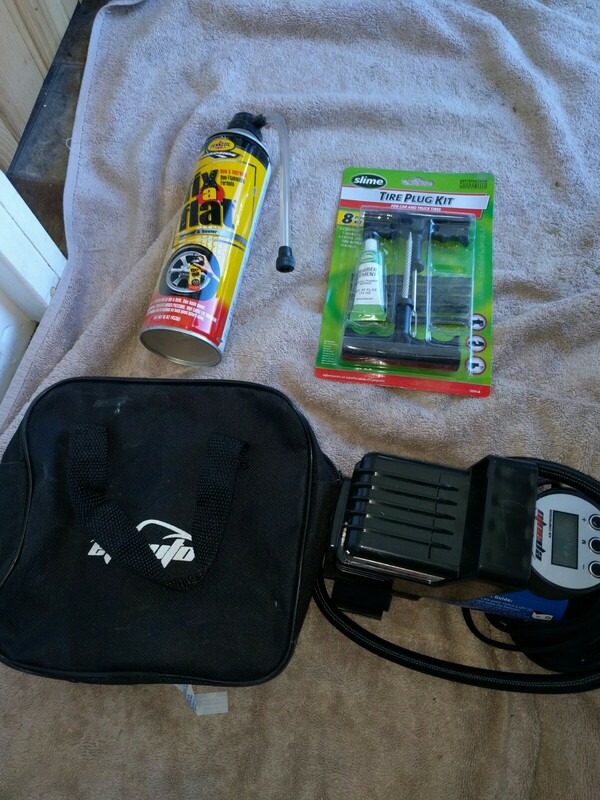 The bottom item is a compressor to inflate the tire after putting the rubber plug in (or fix a slow leak enough to get to a tire service place). The compressor plugs into a cigarette lighter 12 volt socket — its not fast, but it does get there. 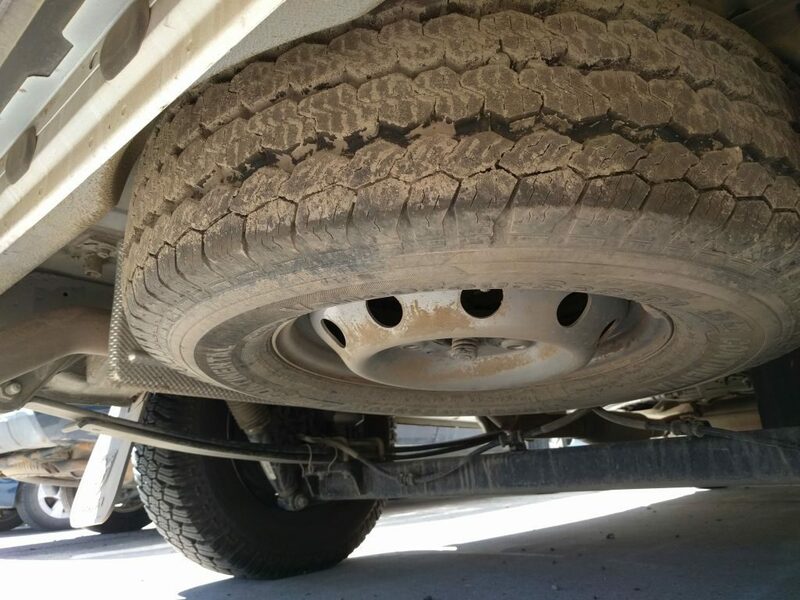 On our Yukon trip, while waiting for our destroyed tire replacement, we met a couple in a camper that used a similar kit to fix a puncture well enough to limp into the tire service place. The upper left item is a can of flat fixer sealant. Have no idea how well this works (if at all), but it was easy to add as a 2nd backup. Before our Yukon trip, which involved 500+ miles of gravel on the Dempster Highway, we considered adding a 2nd full size spare to be carried on a rack on the back door. As it turned out, this would have been a good thing to do, and would have saved us both some time and money when one of our tires was completely destroyed, and we had to wait at a remote location for a couple tires to be shipped in. 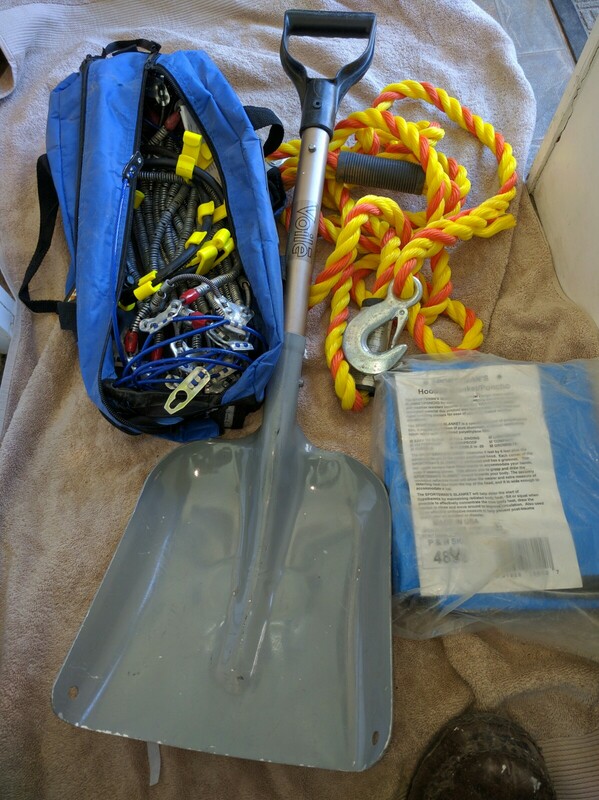 But, if you are going to drive mostly paved roads with limited gravel, I think that one full size spare is OK.
We carry the tools below to get unstuck from snow or mud or unintended excursions into the ditch. There are tire chains, a shovel, a tow cable and a small tarp to lie on while installing chains (or changing tires). We have used all of these multiple times to get us or others unstuck. Its also important to know where to hook up the tow strap — a lot of vehicles now have tow eyes that screw into the van bumper area. Good to locate a place to tow on both front and back of the vehicle. If you do get stuck be sure to keep calm and work things out carefully and make sure everyone will be safe during the operation. Electrical problems are pretty common on camper vans given all the electrical stuff we tend to add. 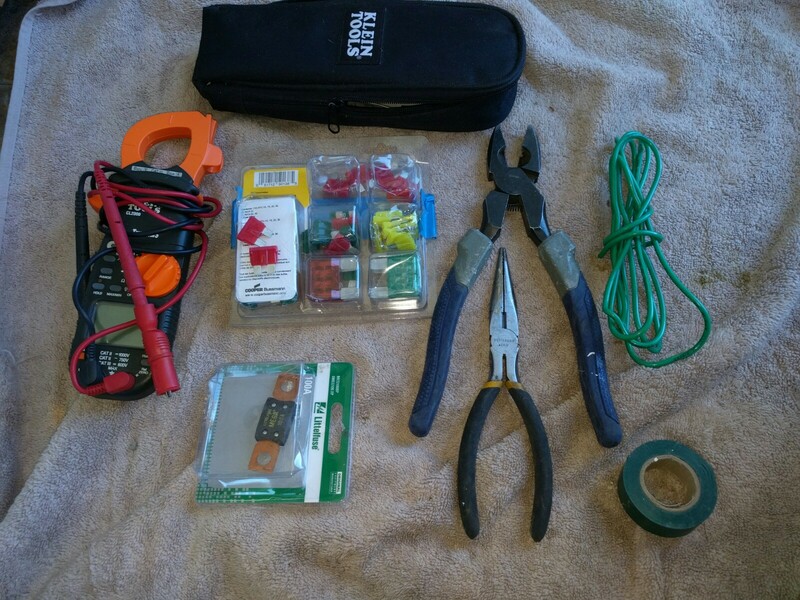 This is the electrical tool kit we carry.. Spare fuses, electrical tape, spare wire and wire nuts (not in picture), multimeter, needle nose pliers, and lineman pliers. Screwdrivers are in the general tools below. The meter I have measures DC or AC current by just clamping it over a wire, which is pretty handy for trying to figure out what’s going on, but even one of the $5 ones from Harbor Freight or the like is a big help. These are the general purpose tools we carry for fixing odds and ends that go wrong. This is what we are in the way of general fix it tools: two sizes of channel locks, adjustable wrench, vice grips, lineman pliers and needle nose pliers, allen wrench set, two regular screwdrivers, a socket screw driver with a wide variety of heads for different types of screws, and a multitool (like a Leatherman). Also carry several flashlights that are not in the picture. I used to carry jumper cables, but have switched over to one of the emergency lithium battery packs for starting the van if the battery should be run down. Its kind of amazing that one of these llittle batteries can actually start a car or truck with a dead battery, but I’ve used it and it works, and there are lots of YouTube videos out there with examples of cars and trucks being started under difficult conditions with these little batteries. Most of them can also be used for charging phones and laptops and also have an LED light built in. Please add a comment below if you have ideas on other or alternate things to carry for emergencies. I never travel anywhere without two jacks. That way two light weight scissors jacks can provide even better stability than one much heavier jack. Especially for tricky side-of-the road situations or for where semi’s want to blow you over. Also, I would add a set of open end and box wrenches. Also, a set of 3/8″ drive sockets and rachet, plus a 1/2″ drive rachet with a 1/2″ to 3/8″ adapter. We always carry a hammer and a pry bar. We also carry a spade instead of a coal or snow shovel. It may not hold as much in a shovelful, but it’s better for any digging. We also have a Garmin (formerly Delorme) InReach) for emergency rescue. Main reason we got that was for when I ride my motorcycle in back country, but seems like a good idea to take it when we’re remote boondocking with our camper. Thanks for the equipment suggestions. Had not heard of the InReach before — pretty impressive. I guess you have to have a satellite subscription for the InReach? Can you tell us what that costs? There’s a $25 (or so) yearly subscription, and a ~$10/month activation fee. The activation fee can be suspended for the months you are not using the thing. We do have solar, but it charges the house battery and is isolated from the van battery. We could fairly easily short around the isolator and this would put the house battery and van battery in parallel, which might work for starting. If both batteries are down, then it would likely take several hours of sun to get to the point where it would start the car. 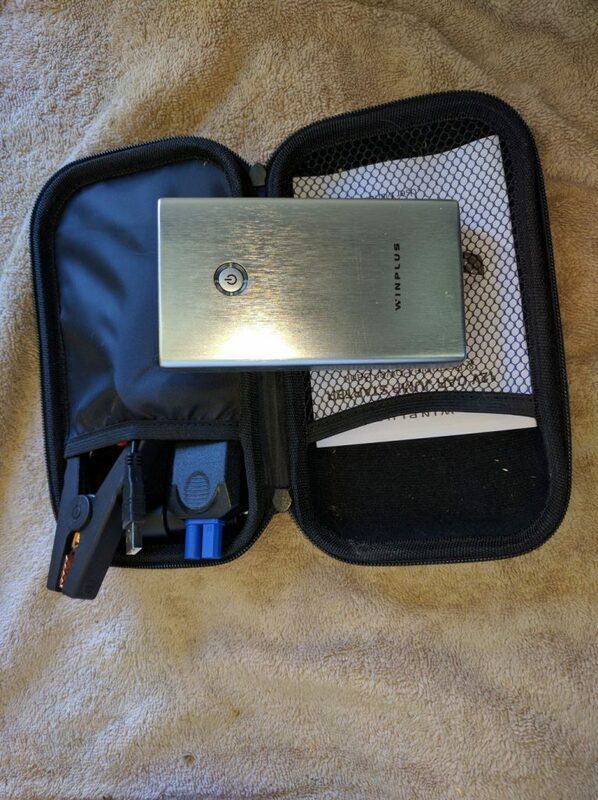 So, the solar could be another backup for starting, but the emergency lithium battery seems simpler and is pretty cheap and easy to carry. I assume you have a 12v system, charged by solar, onboard? Any reason you couldn’t jumpstart your dead battery with that?